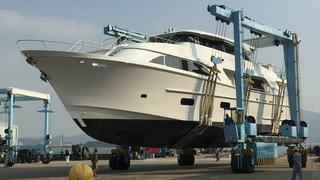 GLOBAL 104 is a Loading... luxury yacht, built by Cheoy Lee and delivered in 2016. Her power comes from two 1900.0hp Caterpillar C-32-ACERT diesel engines. She was designed by Michael G. Burvenich with Jon Overing developing the naval architecture, and the interior design was created by Sylvia Bolton.